This image (probably my strongest of 2016) perhaps offers an insight into what I do differently. The best place in the world to see lions is empirically the Serengeti – the reserve hosts over 15% of all the lions in Africa. To me the distinctive feature of the ecosystem are the Kopjes – the enormous rock formations that hint at the area’s violent volcanic past. They add texture, scale and mystique to the grass plains with which we are all familiar. The Kopjes are spread all over the Serengeti but the most distinctive structures are to the less popular south – which sits some way off the migration route. 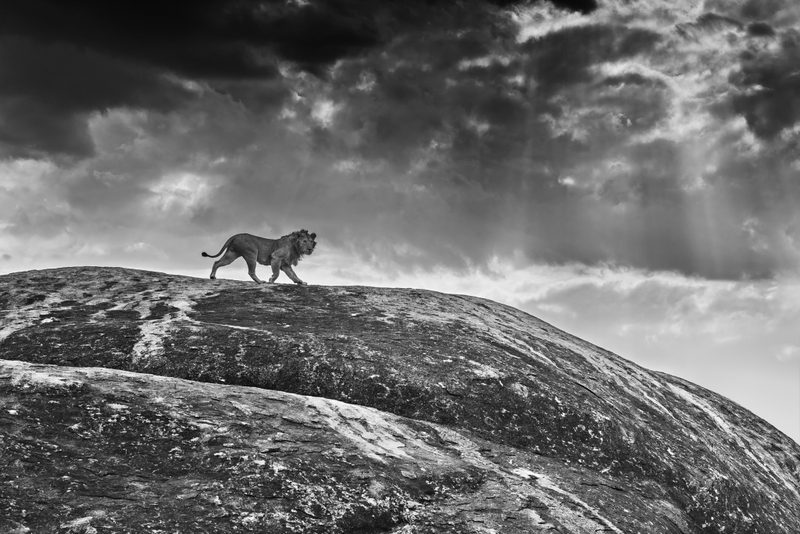 I did not just turn up and snap a lion striding majestically across the top on an enormous rock. This was a product of a great deal of homework. I had exhaustively studied the work of others and felt that something was missing – specifically context. The image is “up there” for me and in retrospect a few hallmarks of my work are very evident. Firstly there was no one else there just me and my local fixer. If there had been, this would not have happened (the lion would have run away from the throng, not run perpendicularly across the rock). Because no one else was there, there are no other images of this moment. Singularity has two benefits – firstly the possibility of being able to immerse gently in a situation and secondly knowing for sure that the image is unique to you. I hate traffic and crowds – I like to work on my own. Conversely, two and a half hour’s drive from where this image was taken, the traffic around the main Serengeti airport removes any serenity – it’s a zoo! (See below). Not one of these jeeps would even consider my destination. It is too far south west of the central Serengeti. Being on you own allows you to take control. I was out of the jeep and within 20 yards of the rock. The second trait that is validated here was that it was desk research that told me to go to the Moru Kopjes – this is where I had the best chance of seeing lions on rocks with no other vehicles in sight. It required fairly painful journeys to the same spot four times a day. One and a half hours there, one and a half hours back, twice. So six hours in a jeep everyday on the same route. In total 30 hours driving over the assignment. Climatically, my knowledge of the weather system there, suggested that mid-June could offer dark cloud in the afternoon coupled with shafts of light. With a clear sky, this picture would lose much of its impact. Finally, the raw, mystical and elemental nature of the image is very much my style. The world does not need another picture of a lion sitting in long grass – I went to the Serengeti wanting something that would transcend. I had trawled through every picture I had seen of lions in the Serengeti and I knew that the Kopjes were the right space – and the Moru Kopjes – especially the far off ones – would have the least number of tourists. It is haunting, visceral and elemental as one – it could be from 2000 BC as well as 2016.